Looking good, glad to see you back again! Plants are growing out of control! Haha. I actually think I might of started them a little to early as I didn't expect them to grow this fast under the lights. 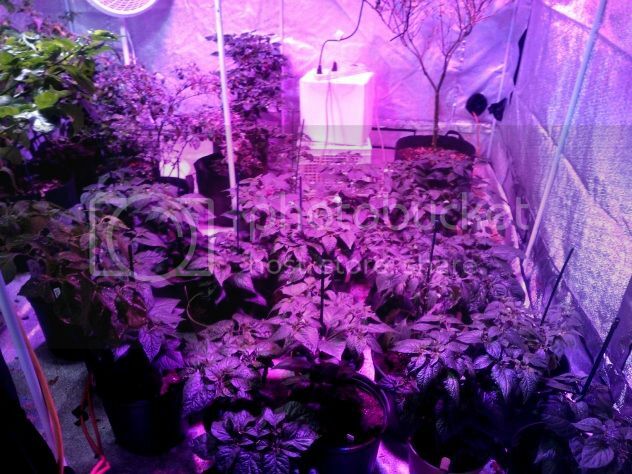 In any event, I've had to now move most of them out to my grow tent. The aphids started to attack them inside and they were getting to big to fit in the area I had them. I have a ton of ladybugs in my tent so the aphids didn't stand a chance once i moved them out there haha. It was a massacre! A glorious one! Do you have all four solar flares going in there in those recent pics? I'm interested to see how productive the plants will be with the lights that high. In the latest pictures i have 3 solar flares going and then a regular light to maintain my over winters. All new plants are under the solar flares though. The light over the new plants is slightly lower than the rest of them. It just looks high because i took the pictures in a manner that you couldn't see the light. It is higher than normal though as I needed to slow down the growth rate. Really nice setup. I see you haven't posted since Feb. Hope to see a update some day. I take it you are satisfied with the LEDs? I hope to start my setup and grow mostly salads at first. In the Spring I will do some peppers and tomatoes. It seems it is better to grow plants that grow relatively at the same heights--that way you can get the lights closer to the plants. right now I am running a ebb and flow 2' by 4' --12" deep grow bed but I am thinking I might add a raft system or one like yours. I might try making mine out of a 6 by 6 pvc fence post. I will post some pics soon. Thanks!